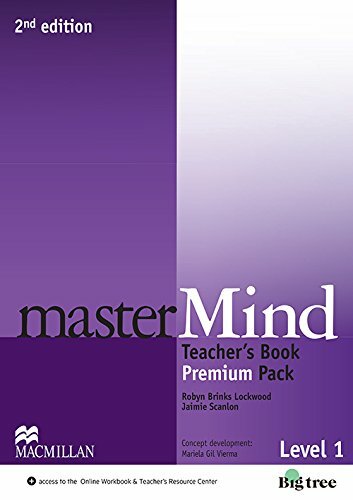 A coleção masterMind consiste em um volume para o nível upper intermediate e outro voltado para o advanced. A segunda edição segue a mesma estrutura pedagógica da coleção openMind, levando em conta a mudança nos interesses, competências e necessidades dos estudantes que se encontram em um nível mais avançado no domínio do idioma. masterMind pode ser adotado como continuidade à série openMind ou de maneira independente. Descubra novos recursos para utilização em sala: ferramentas interativas de apresentação que proporcionam maior engajamento e motivação dos alunos, seja para facilitar o ensino da gramático ou para despertar o interesse da classe para os temas a serem desenvolvidos no Student's Book. As ferramentas interativas são compatíveis com IWB e com computadores e laptops conectados a um projetor multimídia. The Teacher's Book Premium Pack consists of a Print Teacher's Book with Class audio CD, DVD, and webcode access to the Teacher's Resource Center, Online Workbook, Presentation Kit, and Digital Student's Book. Interleaved Print Teacher's Book incorporates the key life skills strand. Detailed notes provide helpful support and useful tips throughout. Steve Taylore-Knowles has been involved in ELT for over 20 years as a teacher, examiner, trainer and author. He holds BA (Hons) and MA degrees from the University of Warwick and is a Licentiate of Trinity College, London (Dip TESOL). His most recent courses, published by Macmillan, are Open Mind (2014) and the American English Mind series. He has also written a number of other successful courses including Laser and Destination. He served on the Executive Board of TESOL Greece and regularly speaks on various aspects of English Language Teaching at conferences and events around the world. He has now relocated to his home county of Lancashire in the north-west of England, where he lives with his wife and young daughter. He regularly speaks on various aspects of ELT at conferences and events around the world and enjoys the fact that his work takes him to so many diverse places. When he's not working Steve tries to find time to go fishing and learn golf. Joanne Taylore-Knowles moved to Greece after completing her Master's degree in English, where she worked as an English language teacher. She taught a range of students there, from young learners to adults, specialising in exam preparation classes, and eventually moved into writing classroom materials. Mickey Rogers grew up in Texas, surrounded by animals, she always knew that she would become a veterinarian. That's why Mickey became an English teacher. Of course, her dream of being a vet was way before people were talking about things like multiple intelligences - all she knew was that she wasn't exactly gifted in the areas of math and science. But Mickey always had a book in her hand, and she was fairly adept at stringing together more than two words at a time, so her future seemed to lie more with words than with numbers and formulas. Mickey graduated from the University of Texas in 1975 with a degree in Spanish and Portuguese, and with her diploma in hand, promptly got a job as a tree surgeon. Doing physical labour in Texas in August was not her idea of a good time, nor was it a very promising career path, so she decided to get out of the trees and go to graduate school. While Mickey was in graduate school, she began teaching at the University of Texas Intensive English Program in Austin, where she taught off and on for about 10 years. After finishing her Master's in TEFL in 1980, Mickey went to Bogota, where she taught at the Centro Colombo-Americano and obtained an advanced degree in going to parties and dancing. Since then, Mickey has taught English in Sevilla, Barcelona, San Francisco, and again, Austin. She was teaching there in 1987 when a colleague asked her if she wanted to go to Mexico City and work for a publisher. She said no, thinking that it was an awfully big city, and also that you probably couldn't get Texas barbecue there. Having said no, Mickey moved to Mexico City in 1988, where she has been ever since. At Macmillan, Mickey has worked as a teacher trainer, a sales rep, an editor, a managing editor, a manager of academic services, and finally as a freelance author, which should give her more free time but doesn't. She co-wrote Style, Skyline and Attitude. Ingrid Wisniewska has worked as a teacher and teacher trainer in Japan, the Czech Republic, the UK and the US. She gained her PhD in language teacher education from Southampton University. She has worked as an editor in ELT book publishing and as a content developer for an online language school. She is now a freelance author and has written many books for students and teachers of English including Learning One-to-One (CUP) and Vocabulary and Grammar Practice for the TOEFL Test (Collins). For Macmillan, she has written workbooks and online materials for Open Mind, as well as being co-author of workbooks for Beyond (Macmillan).